I had the tremendous honor to be invited to the opening ceremony of Kaipi Peru 2014 at the National Museum of the American Indian. What a great opportunity to share my culture with the love of my life my hubby dubby. It is very important since we are TWO DIFFERENT CULTURES, to share and try to make him understand, why we are how we are. Why we are so passionate about everything we do from our food, to our dances, to our culture in general. I think Peruvians we have a special way to love our country. The night began with a speech of the representative of the Museum, then follow by the Peruvian Ambassador to the OAS and the Peruvian Ambassador to the United States Harold Forsyth whom officially inaugurated the event. Then came the most emotional moment of the night with the presentation of ANU Proyecto Universal a group of Peruvian dancers, then our traditional marinera from the coast of Peru and our huaylas a traditional dance from the mountains of Peru. I had tears in my eyes to share this special moment with my husband. It was like being in Peru for 15 min, but we were actually in Washington DC. When ANU started to play and make music with many different instruments and loud noises and I was telling him, maybe now you could understand why Tyler is so loud…it may be in his veins, it may be part of his culture. After the opening ceremony guests were treated to pisco sours and Peruvian delicious ordv’res including aji de gallina, solterito de quinoa, suspiro a la limenha and alfajores. The reason why I share all these stories through my blog is because I would love to inspire other Peruvians to share the love of our country with new generations, with our kids and so that they pass it to their generations. I am just so thankful that now we have the opportunity to have a little bit of Peru so close. 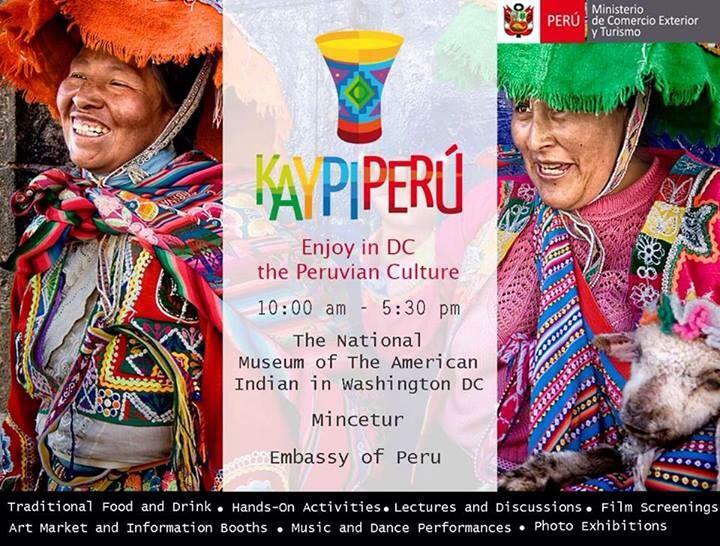 Kaipi Peru will be in exhibition at the American Indian Museum through August 3rd.